Kittens learn first through imitation of the mother cat and then through trial and error. If the outcome is positive, then this is likely to influence their future behaviour. 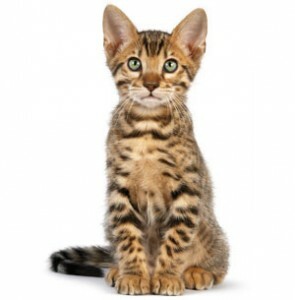 The ideal environment for your kitten is one where she can socialise easily and familiarise herself with people. In order to socialise your kitten make sure she meets and is handled by different people, encounters varying noise levels and comes into contact with other animals. It is important to leave the kitten with her mother until she is weaned, otherwise she may miss out on vital learning processes and may prove difficult to educate. If however the kitten has been brought up in isolation, you should remove her as soon as she is eight weeks old and bring her into contact with other cats. Kittens love to play (it’s pretend hunting), so toys are essential – either home-made, like squashed-up balls of tinfoil, a bunch of feathers tied on to a bit of string, an old ping pong ball, or choose some from your vet or pet shop. Play with your kitten every day – it’s good for you both, and keep it up as she matures so she gets plenty of exercise. Keep safe though – check the toys regularly, and make sure she can’t get into anything she shouldn’t. A kitten starts to learn to hunt from as early as one month old, where she’ll learn hunting postures from her mother. But it’s not until six weeks of age that she begins to understand which prey can be eaten. By the age of two months, she is no longer scared and can attack, and at six months she can successfully hunt alone. A mother will teach a kitten to be clean, and from five to six weeks old, your kitten should be using the litter tray and covering the mess up. If your kitten is having problems, place them in the litter tray and show them what to do. Dig a hole with her paw and cover it over. You should only have to repeat this exercise a few times before they get the hang of it. Clean the tray out frequently – remove ‘clumps’ everyday, and once a week use a cat-friendly disinfectant, allow it to dry and completely replace the litter. If you are pregnant, ideally get someone else to do it, or otherwise always wear rubber gloves, and wash your hands thoroughly afterwards. When it comes to a cat’s territory, quality is more important then quantity. Although in the countryside a female cat’s territory can extend to 3 acres, and a male’s to 30 acres, ten cats will happily share a single acre in built up areas. The important part is that their territory is exclusive and never overlaps with that of another cat. Your cat will identify your home as its territory and will organise its life around this area. Cats tend to prefer areas with a layout that offers opportunities to play, be up high and hide away, compared to a bare space. Within her territory, the cat will have four distinct areas: the eating area, an area for rest, the toilet and a large area for play. You should not disrupt this organisation, or your kitten could develop behavioural problems. Eating area: The eating area should not be near the toilet area or your own eating area. If possible, avoid the kitchen or dining room so that your kitten does not confuse your meals with hers, which could lead to a nutritional imbalance. Rest area: The position of the rest area changes depending on where the best heat sources are, and your kitten will probably choose to rest near a radiator or in the sun. If you have a sleeping basket, position it in a warm place nearby to you, as your kitten will also enjoy being close to you. Toilet area: Choose an area away from the kitten’s food for the toilet area. Play area: The play area is the largest of the four, and the best living areas have ample opportunities for playing, racing about and climbing up high (cats love to be up high). Cats also adore places where they can be at the same level as your face and rub against you as they would another cat. Deep sleep: From birth until eight weeks of age, all sleep is deep and continual, during which essential growth hormones are secreted. At the age of 2 months, the continuity of sleep decreases and your kitten alternates light sleep and deep sleep. During the deep sleep period, you should never wake a kitten as it could affect their growth. Light sleep: Once the kitten is two months old, their sleep rhythm will gradually move towards that of an adult cat – sleeping for several periods for a total of around 16 hours a day. During this light sleep, cats sleep with one ear listening – conscious of even the slightest noise.